The insects are tiny right now- it's hard to tell what exactly they'll be a few months from right now. This creature has been living amongst the leaves of a common milkweed plant that I have in a pot just near our deck. Since it lives in a potted plant, I can move the pot or rotate it to get just the right angle. Any guess as to what this creature may grow up to be? I'm guessing some type of katydid, but that is simply a guess. Here's another image of a similar organism that I took a few days later. Looks a lot like this guy, so you are right. 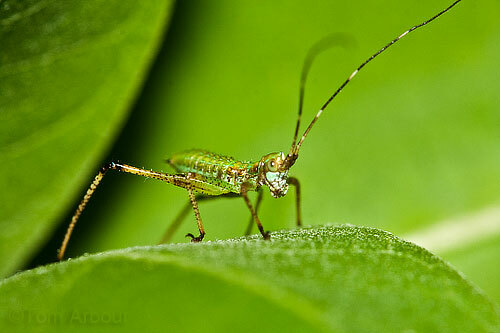 Possibly a Scudder's Bush Katydid. Cool! Thanks Janet- those images at bug guide are so amazing- the contrast of the bright green insect on the red background is electric. I don't know what it is but wow, what a looker! Great shot, Tom! Great photo! I don't know if you realize this, but if you create an account at bugguide.net, you can upload photos of any insect that you want ID'ed. I've done this a number of time, and the people there have been really helpful. Outstanding macro! Macro photography is one of my favorite types of photography. I don't have a dedicated macro lens (yet), but I still manage to get some pretty decent macros. Deb- Oh yeah, I frequently contribute to bug guide, but I often don't send pictures of Juveniles- adults are pretty hard to ID with photos. Plus if I uploaded it there, we wouldn't be having this great conversation amongst us bug buddies! Thanks Misty Dawn- What type of setup do you use? Today's P&S cams have amazing macro capabilities, but you just can't go wrong with a DSLR and a dedicated macro lens. I use the Canon 60mm ef-s on my Rebel XTi.